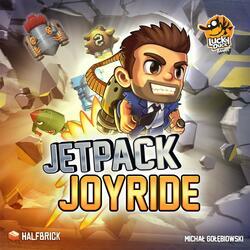 Jetpack Joyride is a competitive real-time puzzle game for 1 to 4 players inspired by the famous mobile game of the same name. Players must find their way through the secret lab using a stolen jetpack in a series of three rounds (20 minutes). Jetpack Joyride was funded on the Crowdfunding Kickstarter (See the campaign) platform on the 31 July 2018, the campaign lasted 21 days. 3,230 people helped funded the game, whose the amount requested was $8,000.00. Thanks to these 3,230 people the game could be funded up to $183,296.00, ~2,291.20%.